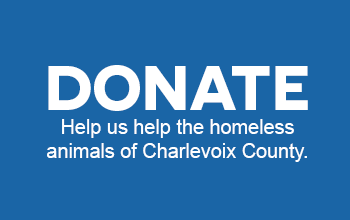 Dedicated to the protection and care of all animals, the Charlevoix Area Humane Society is an independent non-profit 501(c)3 no-kill animal shelter that has been serving pets and their humans in Charlevoix County since 1974. We rely almost exclusively on donations and fundraisers to help the lost, neglected, abused, and abandoned animals of Charlevoix County. In 2017 our Save Rate was 97%. Click here to view our 2017 Animal Statistics. Run ForTheir Lives! 5K Run/Walk, Dogs Welcome! @ 8:00 A.M.
During any holiday season please contact the shelter for changes in hours. Copyright © Charlevoix Area Humane Society. All Rights Reserved. Powered by Sygnifi Networks.